How I turned a random lead into a documented relative. I'm lucky to have such an uncommon maiden name. Nearly everyone named Iamarino can trace their roots back to the same small town in Italy. Recently, an Iamarino from Brazil went to visit our Italian ancestral hometown. She visited 3 months after I did. I saw her photos on Facebook and recognized all the places I'd seen on my trip. I've known about this particular Brazilian Italian cousin for 10 years. A mutual friend told me about her ancestry. 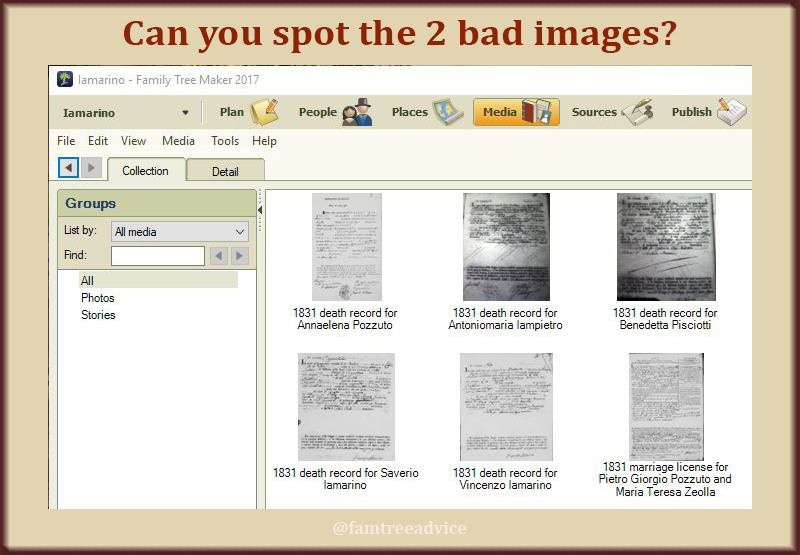 Seeing her photos reminded me how much I want to learn about the Iamarinos who left Italy for Brazil. That's why I'm diving into some Brazilian records on FamilySearch.org. I've chosen a database called "Brazil, São Paulo Immigration Cards, 1902–1980". I've entered only the last name Iamarino in the search area. There's only 1 result, but it's intriguing to me. The photo of this 80-year-old widowed man, whose mother was named Iamarino, is calling to me. A search for my maiden name brought up this man. What more can I learn about him? I don't read Portuguese, but some things are clear. Miguel Basiloni is an illiterate farmer who was born in Colle Sannita (misspelled on the card) on 2 July 1895. 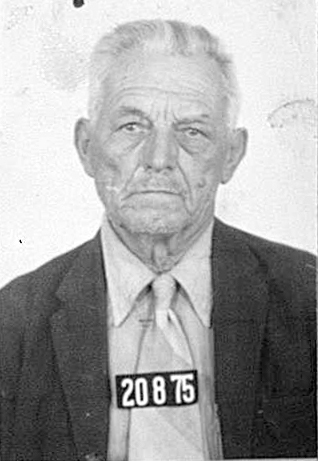 His parents were Antonio Basiloni and Maria Iamarino. My experience with Colle Sannita records tells me "Miguel's" real last name is Basilone, ending in an e. And I'm sure his given name is Michele, the Italian version of Miguel. So I'm going to search my collection of Colle Sannita vital records and my family tree. Let's see what I can learn about this man. The 1895 birth record of the man in the photo. Michele Basilone was actually born on 1 July 1895 in Colle Sannita. His father Antonio was a 26-year-old farmer. His mother was Marianna (not Maria) Iamarino. Let's go find his parents' births, shall we? 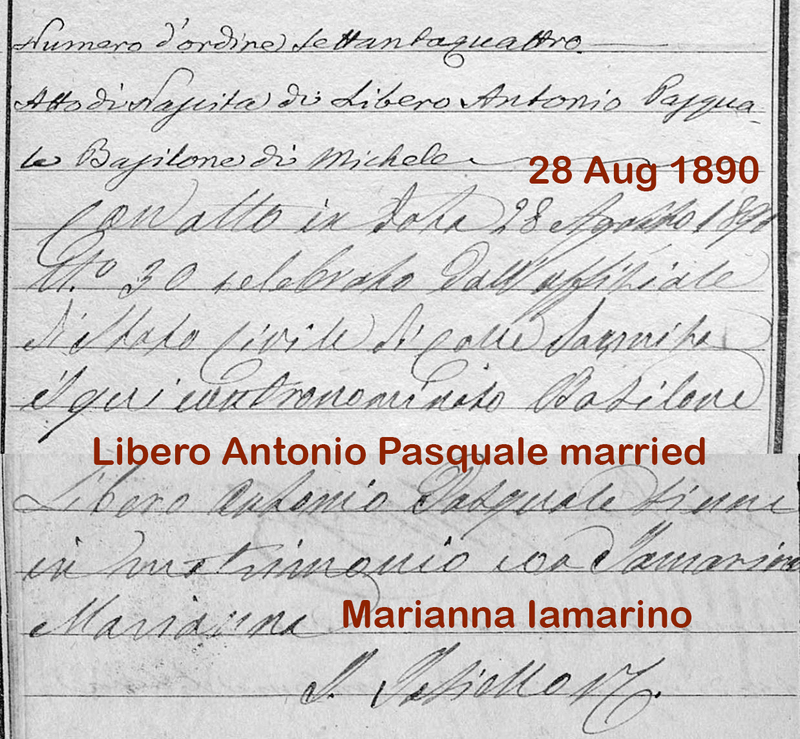 I'll search the birth indexes for Antonio Basilone and Marianna Iamarino in and around 1869. There is no Antonio Basilone in the 1869 index, but there's a Libero Antonio Pasquale Basilone. I've got to take a look at him. 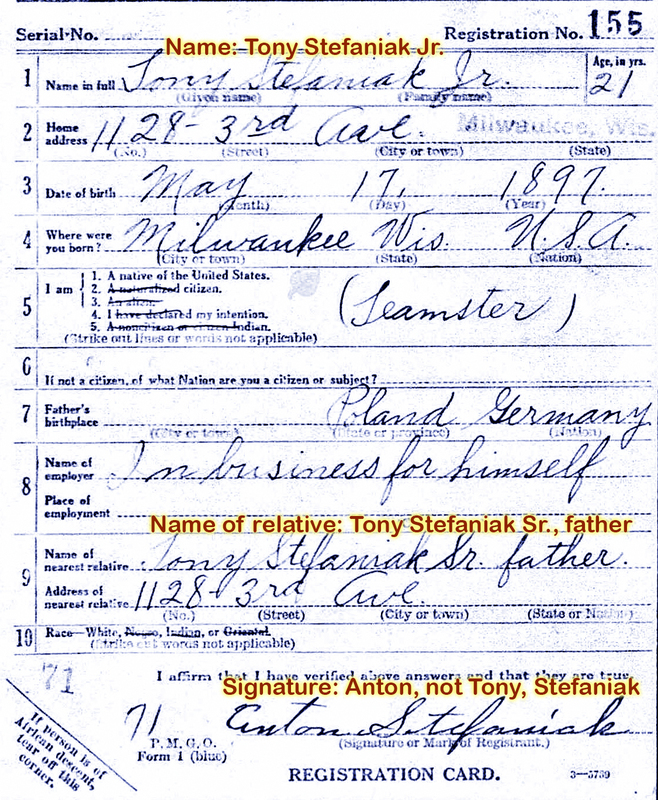 Michele's father's birth record includes his marriage to Michele's mother. 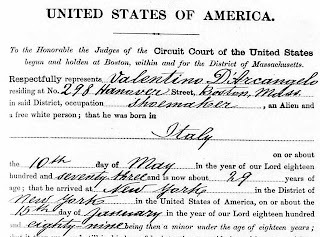 I didn't have to go far to find Marianna Iamarino's birth record in 1870. Finally I have a connection! Marianna's parents are already in my family tree. She is my 3rd cousin 3 times removed. That makes Michele, the somber old man in the photo, my 4th cousin twice removed. Michele's mother's side of the family was already in my family tree. I'm a little worried because Marianna's birth record doesn't mention her marriage. So I'll keep checking the surrounding years. 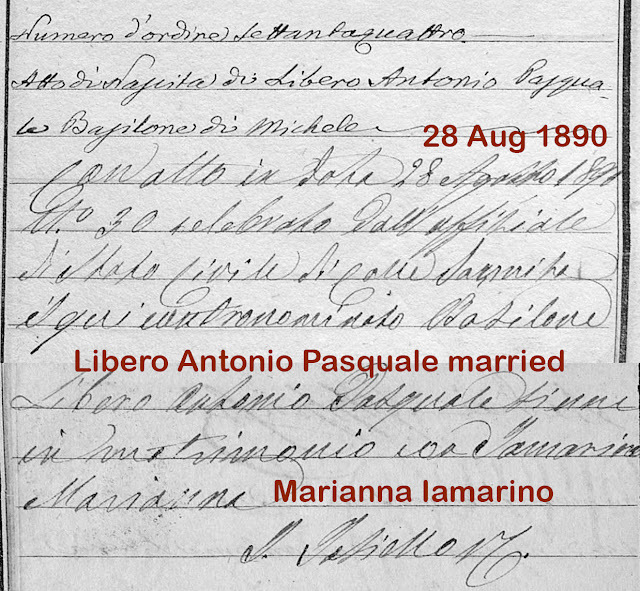 It's possible that the Marianna born in 1870 died, and another was born and married Libero Antonio. My cousin who went to Brazil. OK, there are no more Mariannas, so I believe I've got my gal. Marianna was not a common name in this town. Ironically, it was my great grandmother's name, but she's from a neighboring town. I'm sure I can find Michele's siblings by searching the birth records starting in 1891. 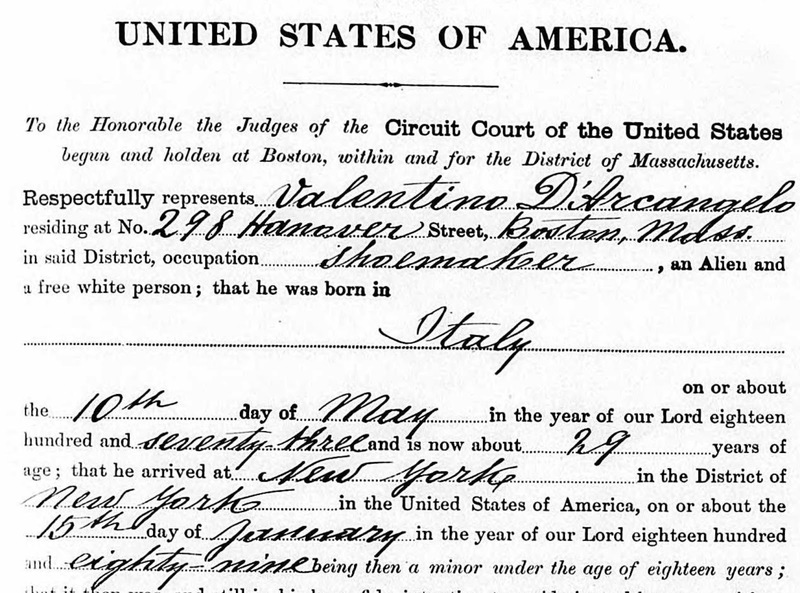 I may be able to find Michele's marriage record, but only if he married after 1930. There are marriage records available from 1931–1942. Every evening, with the Yankees playing on the TV, I sit here at my computer. I pick a genealogy project for the evening. Michele was an unexpected project that I'm feeling really good about. Michele Basilone looks very sturdy and solid for 80 years old. I'm happy to see his face and know that my first search in the Brazilian genealogy records gave me my 4th cousin twice removed. Olá, Miguel. 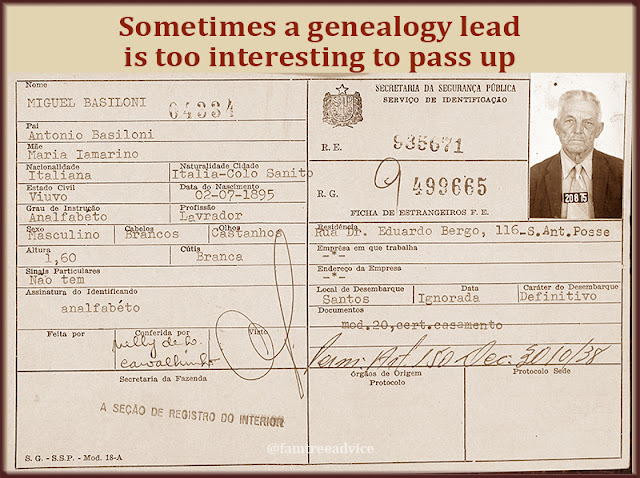 Ever wish you could look over another genealogist's shoulder to see how she does things? Look at this. I've decided to do everything the right way from the get-go so I don't have to double back and fix or add facts. As I was methodically tackling one item on my genealogy to-do list this weekend, it struck me. There are so many steps to this process! Does anyone else go to this much trouble? Let's find out. Take a look at what I was doing so thoroughly this weekend. 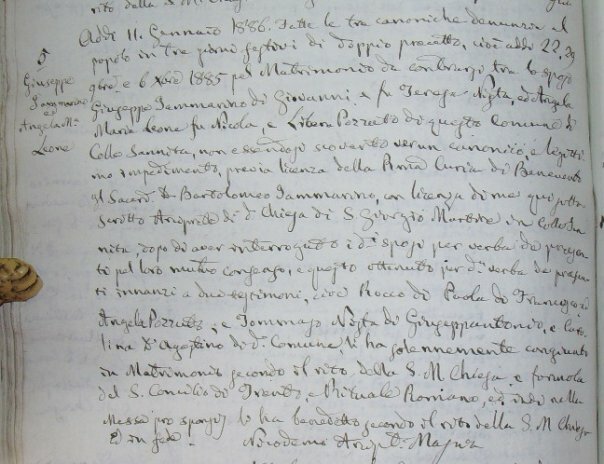 Years ago I viewed and transcribed every vital record (1809-1860) from my grandfather's Italian hometown. 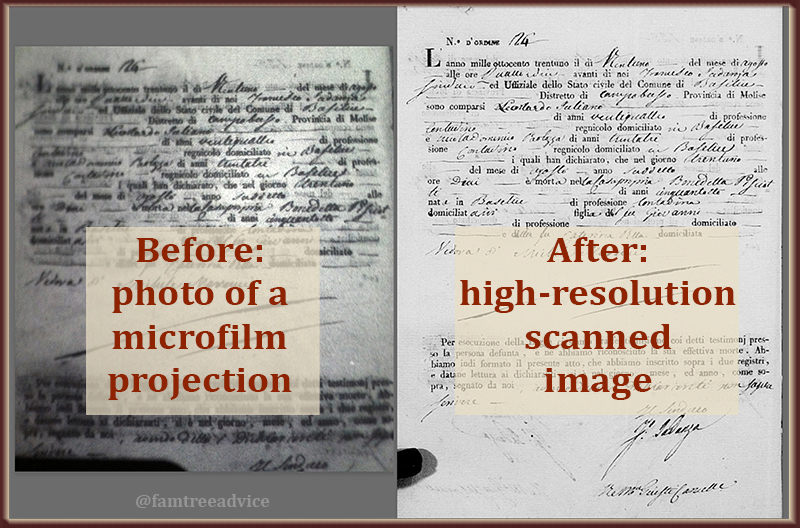 I used some poor-quality microfilm viewers at 2 Family History Centers. At the first FHC, I used their computer to capture several of the images as jpg files. But they weren't very clear. At the second FHC I took iPhone pictures of some documents projected on the surface of the microfilm viewer. Terrible, ghastly quality. Awful, pitiful old image vs. new, glorious image. 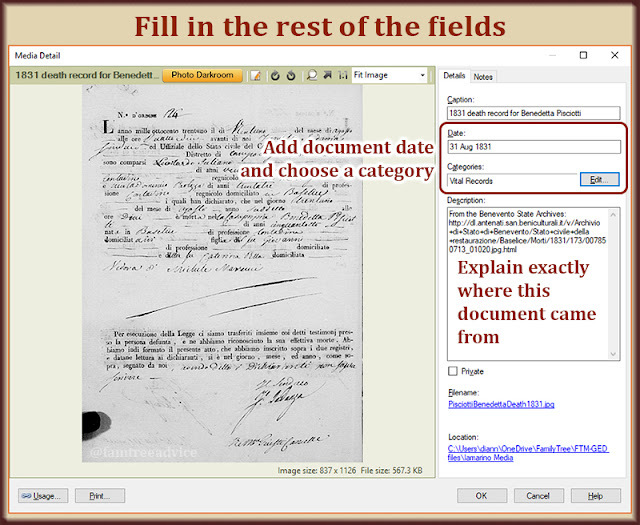 Now there are excellent, high-resolution images of those same documents available online. I downloaded the entire town (and others) to my computer to make my research easy. Now I can replace those crummy old images in my family tree with excellent ones. 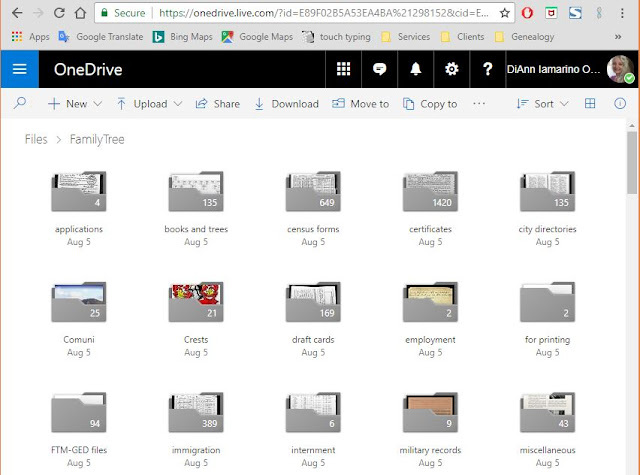 recording each document in my document tracker spreadsheet. 1. Identify a bad image. The Media tab in Family Tree Maker makes it pretty obvious which documents are the bad ones. So I can pick any one and dive in. Hint: The bad images are dark and fuzzy looking. and things are easy to find. 2. Find the good image. 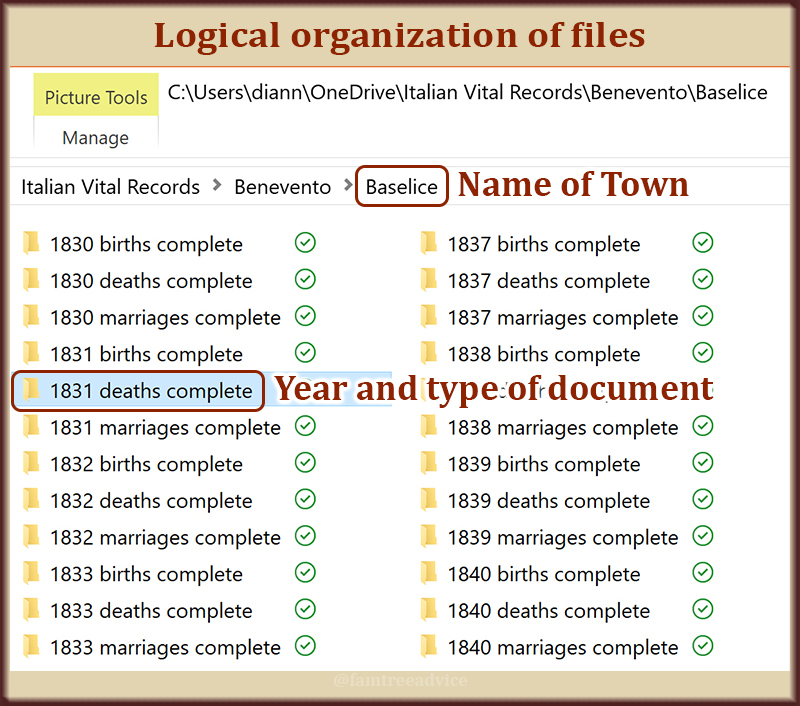 I've got the Italian vital records carefully organized on my computer. My subject, Benedetta Pisciotti, was from Baselice. So I go straight to the Baselice town folder. She died in 1831, so I go to the 1831 deaths folder. I know the date and I can see the document number in the original. This makes it easy to find the image I want. 3. Crop the image and name it appropriately. If there's more than one document in the image or it's crooked, I crop it in Photoshop. I save it in the proper folder and name it in my usual style: LastnameFirstnameEventYear, so PisciottiBenedettaDeath1831.jpg. 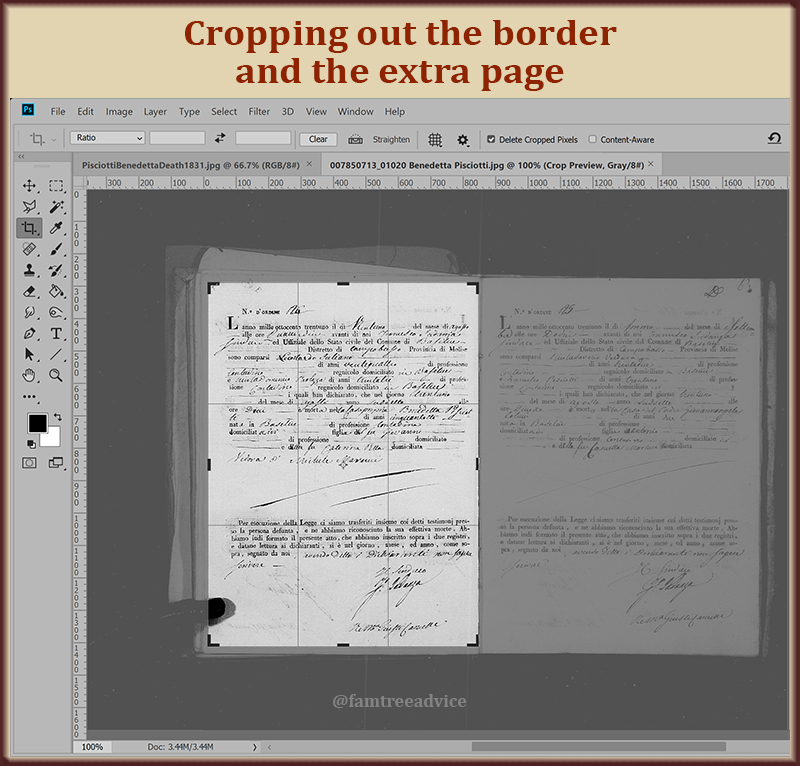 Using Photoshop to crop out the other document and the huge black border. 4. Annotate the image's properties. 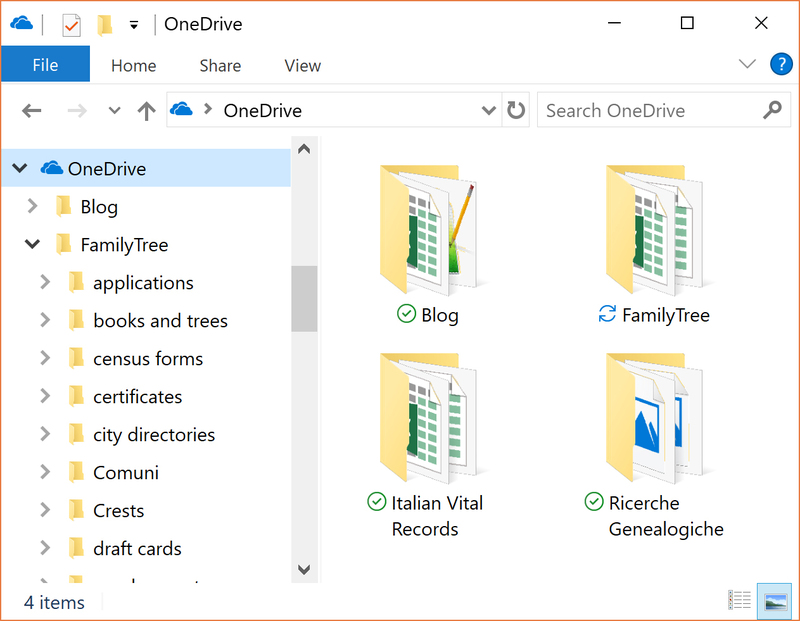 In each of my folders of Italian documents I have a text file called "URL format". It contains the format of the URLs where these documents came from. For example: 007850713_00000.jpg. I simply replace the last 5 zeroes with the last 5 digits of the image's file name. Now I right-click the cropped image and choose Properties, then the Details tab. 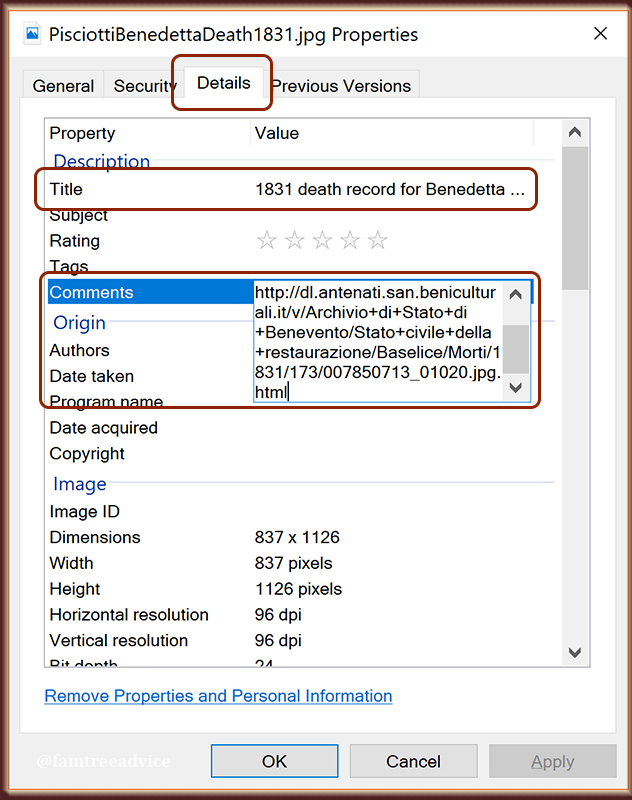 I edit the Title field ("1831 death record for Benedetta Pisciotti") and the Comments field ("From the Benevento State Archives" and the image's original URL). 5. Replace the image in Family Tree Maker. 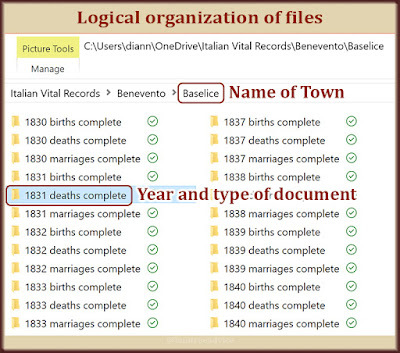 To remove the old image from Family Tree Maker's media library, I detach it from Benedetta and put it in the trash. Now I drag and drop the new image into Benedetta's Media tab. The image retains the title and comments I gave it in step 4. But I also want to enter the date of the event and select the Vital Records media category. When I synchronize, all these details are on Ancestry.com for potential cousins to see. 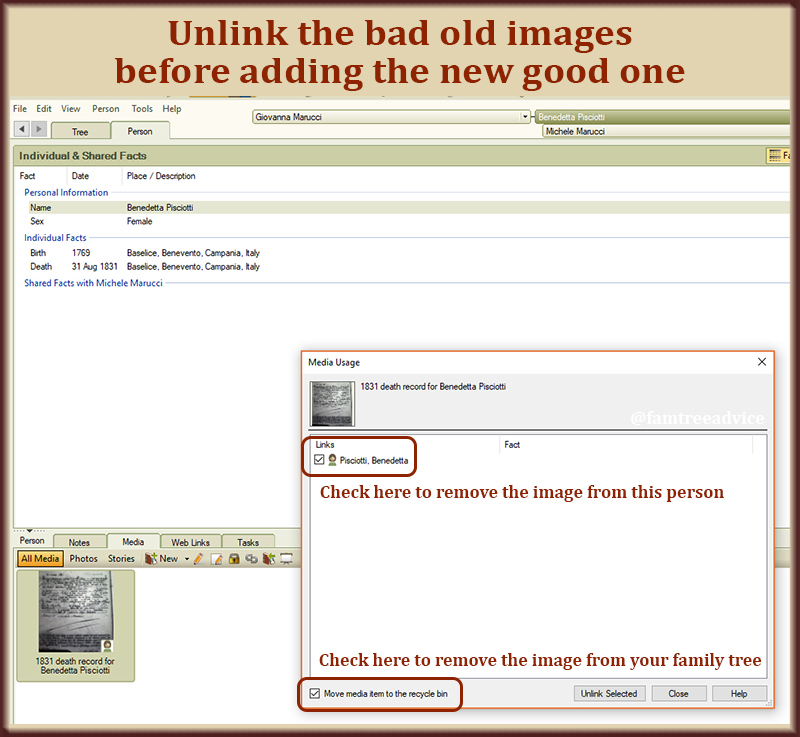 Check the boxes and click "Unlink Selected" in Family Tree Maker to remove the old image. Don't skimp on the annotations. 6. Update tracking spreadsheet. 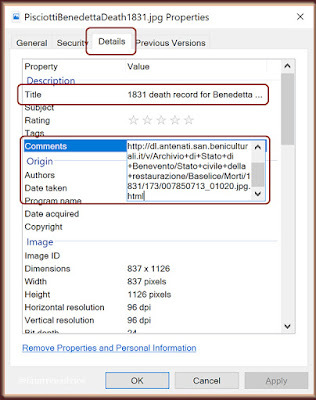 Finally, I record Benedetta's death in my spreadsheet of all documents. I add a line for Benedetta and put "1831 (cert.)" in the Death column to show that I have a copy of the certificate of her death in 1831. Updating my inventory at that moment is critical to being thorough. Detailed, yes. But it's a process that becomes second nature. When I complete this project, I'll be rid of those dark, fuzzy document images. And I'll have fully annotated images. 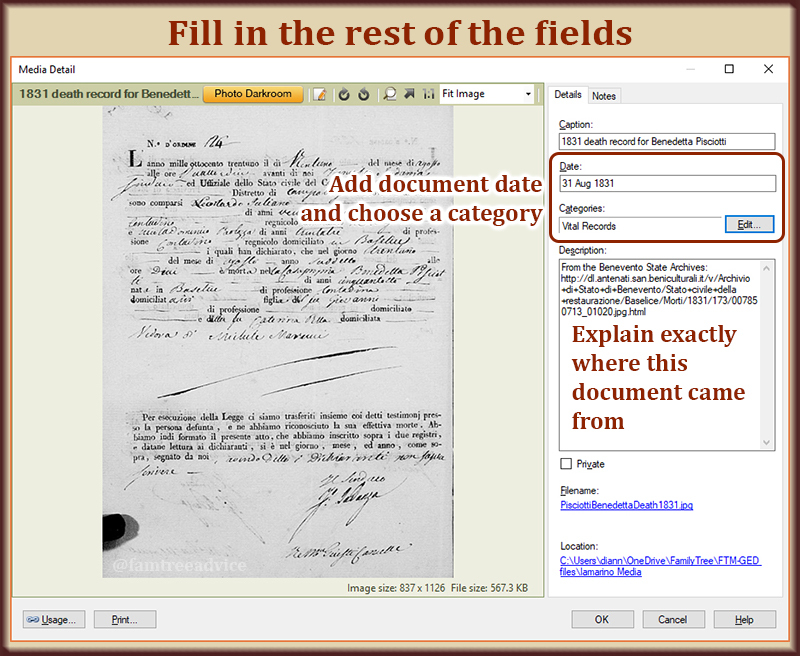 They'll have a descriptive title, date, category, and source citation. 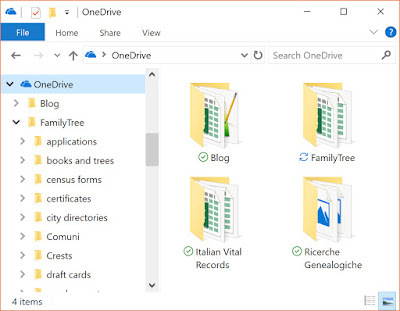 I think it's worth all the steps and the juggling of File Explorer, Photoshop, Family Tree Maker and Excel. Don't you think your tree is worth this kind of effort? Here's an infographic to show you the states or territories included in each U.S. Federal census, 1790–1940. 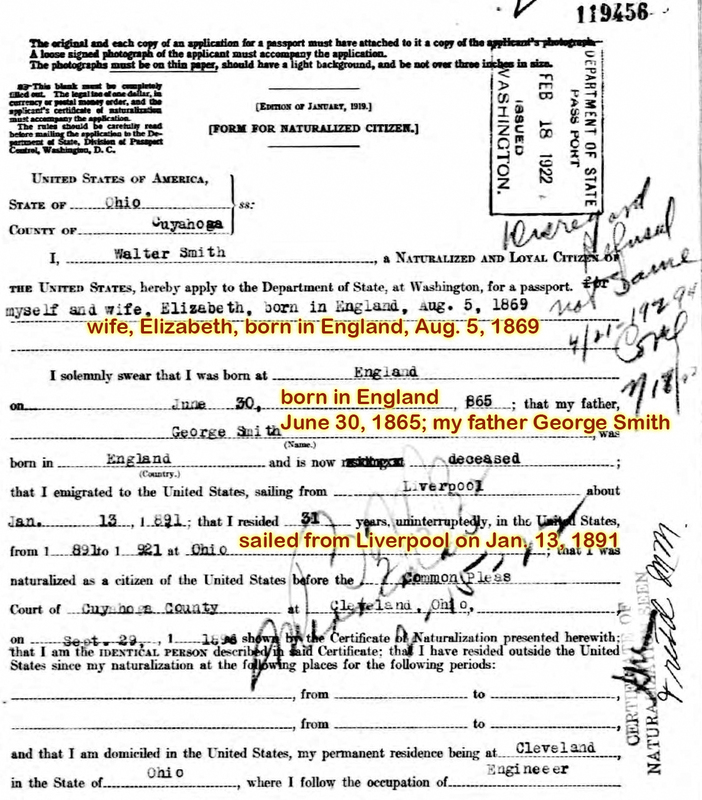 Knowing these facts can save you from trying to find your ancestor in a state that didn't yet exist. The new states and territories counted that year. New questions asked and facts recorded that year. It's interesting to see the increasing detail gathered from census to census. In another article I'll explain some of the history that led to adding those particular questions to the census. You can download this graphic as a PDF. I've also created a printer-friendly version in black and white for letter-size paper (8½" x 11"). I hope your ancestors weren't like me. In high school I didn't join any clubs, and I played no sports. My yearbooks won't tell you much about me. Except that I'm a nerd because I was in the National Honor Society. When my husband (the former high school track star) told me about all the sports his father Ben played, I wanted to find Ben's yearbook. So I searched Ancestry.com and found the 1934 yearbook from Sanger High School in California. That was the year Ben's older brother Abe was a senior, Ben was a junior, and their brother Bill was a freshman. If you can find your ancestor's high school yearbook, here are 5 key things to look for. 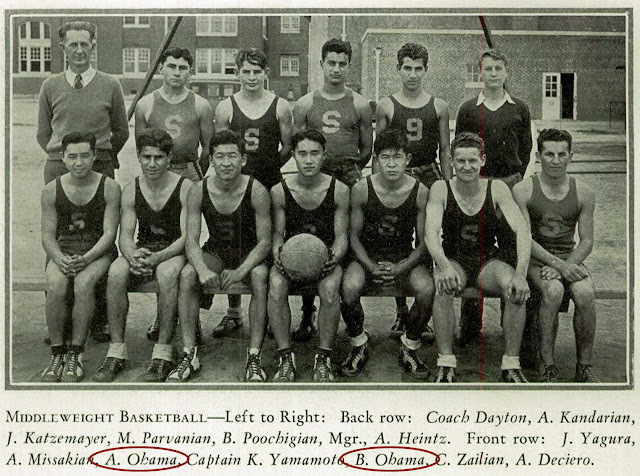 Abe played basketball and ran track. Ben played basketball, ran track, and played football. Bill played basketball and ran track. Their faces in each sports photo told me a lot, too. Ben looked determined and angry—nothing like the kind man I knew. Abe looked confident and pleasant. Bill looked sweet and shy. Bill grew up to be an accountant, so we weren't surprised to find him in the Scholarship Society and the Latin Club. But finding Abe there with his little brother in the Latin Club was a surprise. We think Ben was too busy with sports to pick a club. My husband's uncles, Bill and Abe, standing together in the back row of the Latin Club. Maybe your ancestor was in all the school plays. Does that match what you know about them? In my own high school yearbook the seniors included a quote or a few words. My words seem like utter nonsense. But if you read what everyone wrote, it becomes clear who my closest friends were. We all used the same bizarre phrases. Look at the candid photos, too. 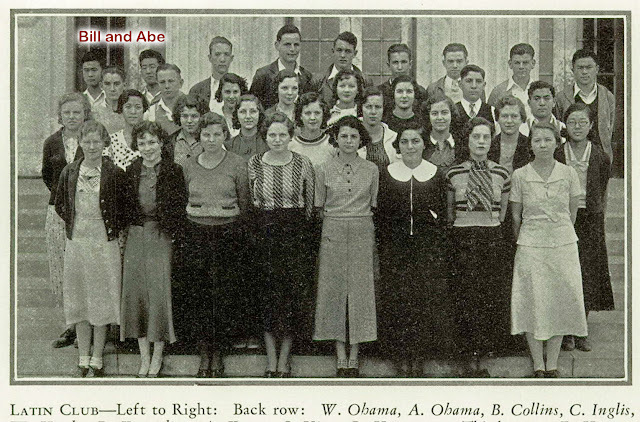 If you find your ancestor goofing around with some other students, try to find them in a class photo and identify them. In some yearbooks, seniors will write what their plans are. They may say where they're going to college and what they'll study. Maybe they're joining the military. Or they may say which trade or profession they're about to start. Will you be surprised by what your ancestor was planning to do? My father-in-law's yearbook includes advertisements from several local businesses. The names of the businesses and their owners reflect a variety of ethnicities. Yet they don't match what I see in the student photographs. 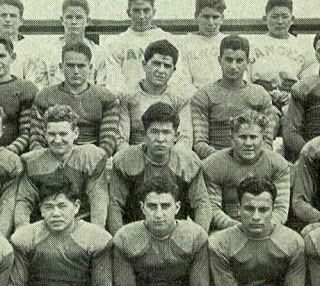 The Sanger High School students in 1934 were about 45% Japanese, 20% Armenian, and a mix of English, Irish and Scandinavian. Of course I spotted the one Italian kid. My husband's Uncle Abe and father Ben on a pretty short basketball team. It may tell you something about your ancestor if you learn they were in a small minority. Or that they were part of a large group. More than all these facts, it's the photos I'm thrilled by. I love having so many never-before-seen photos of my father-in-law and 2 of his brothers as teenagers. If you can access Ancestry.com, search for their "U.S., School Yearbooks, 1900-1990" collection. There's also Classmates.com and other sites that may have what you need. Ancestry has 3 of my father's Bronx, New York, yearbooks, and now I know he was in the school band with my godfather—his future wife's 1st cousin. How cool a discovery is that?